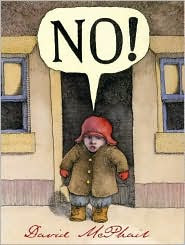 David McPhail, known as the author/illustrator of beloved stories about lovable bears, toy and otherwise, has taken on the sticky subject of human aggression in his beautifully illustrated allegory, No! (Roaring Brook Press, 2009). The title page shows a young boy sealing his letter which we have already seen him writing to "The President." Out into a generic street of row houses, beneath a blue sky, the boy walks as overhead, war planes fly and drop bombs on a distant house. Daunted, the boy looks back but continues resolutely to walk, passing armored police harassing the elderly proprietor of "Ben's Eats," and marching storm troopers. Glancing fearfully but plodding on, the boy passes these same soldiers forcing their way into the home of a frightened mother and her two children, as in the next double-page spread, a column of tanks decimate one of the houses on the street. Finally making his way to the mailbox, the boy finds his way blocked by a bigger boy, a bully who shoves him away and knocks off his cap. The boy has had enough. "No?" responds the astounded bully. And in the way of allegories, everything is changed. The boy mails his letter and turns around toward home, and the bully runs after him to return his cap. The blasted and bombed houses now stand intact, while the police chat with old Ben, the soldiers present gifts to the little family, and parachuting bikes drop from the now benevolent planes overhead. At my school we have rules. No pushing. No bumping. This is obviously a book to be read with an adult and followed by some discussion. Published to almost universal approval of his evocative artwork, the theme has drawn mixed reactions, some finding it a powerful statement of the proverbial quotation. "A journey of a thousand miles begins with a single step," while others find its message simplistic and inappropriate for the picture book crowd. Yet young children need to be reminded of those pivotal nay-sayers of history. In our own national story, many come to mind: Patrick Henry, General McAuliffe's "Nuts!" to his German attackers, Susan B. Anthony, Rosa Parks on that city bus. There is a time for the personal and community NO which, when said like we mean it, has its own power. What if, for example, enough Germans had just said nein to Hitler's imperialistic ambitions? It's worth thinking about, and McPhail's No! is a good place to start.